Hello my lovely followers!! I'm very excited to share this amazing giveaway with you!!! 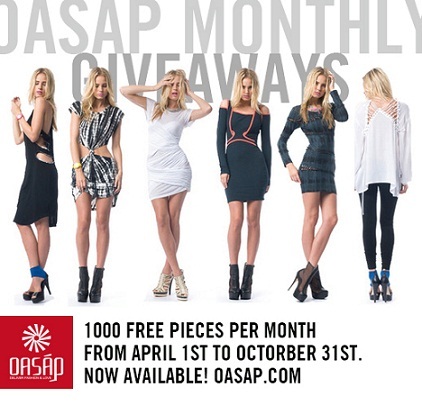 You can win amazing clothes by your own choice!! Registered on Oasap website using the above email ID. Liked your facebook page and Oasap facebook page. My facebook name is Divya Asha. Done n following u on all accounts. thank u for the such a great giveaway..
i love http://www.oasap.com/dresses/28637-gorgeous-embroidered-pleated-lace-dress.html , this dress is so elegant loves d simplicity f d dress. My favorite is the Pink Skater Skirt that you listed up there. I would choose "Fashion Sleeveless Chiffon Dress With Asymmetric Hem"
Crocheted Lace Vest is what I would like to win. Fav: I would love to win the chiffon dress! I WANT TO WIN A HAT, I LIKE IT SO, SO MUCH!